With this certification, the Qt Safe Renderer is now commercially available with all certification artifacts provided to customers. The Qt Safe Renderer solves functional safety requirements in the Automotive, Medical, Automation and multiple other industries. The Qt Safe Renderer offers a high level of reliability and risk mitigation to any application where the correct rendering of graphical information is of paramount safety. An example for this from the automotive industry would be the warning icons on a car’s dashboard (for example in the images below). For medical devices, it would be critical patient readings. Achieving certification requires rigorous development processes, from requirements, to architectural design, to implementation, to testing. When we built the Qt Safe Renderer, we documented every single one of these steps. This documentation, specifically the design documentation, the safety manual, and verification documentation are all provided in the software delivery. This gives companies peace of mind that their safety-critical UI systems will be easier to certify end-to-end when using the Qt Safe Renderer and of course they save time and money along the way by using a pre-certified component. 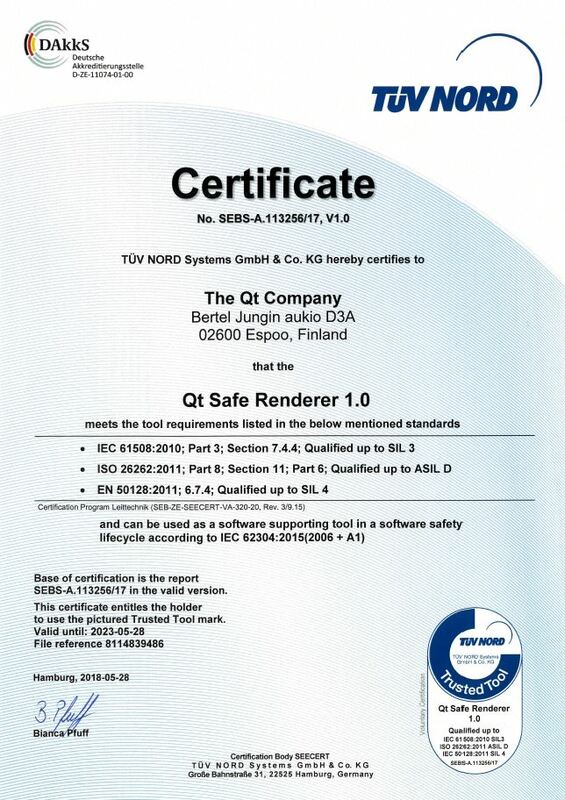 In addition to the certified run-time, Qt Safe Renderer also comes with designer tooling. This tooling allows designers to easily add safety critical elements to their designs. When they run and test their design on the desktop, these items run like regular graphical elements. When built for an embedded safety-critical system, the tooling separates out the safety-critical elements for execution by the Qt Quick Renderer run-time. This is performed seamlessly, making development cycles quick and easy and leaving designers to focus on what they do best. We’ve written quite a few blogs in the past that include technical details on Functional Safety and our solution which can found here. Make sure to watch this webinar where we talk about functional safety and how the Qt Safe Renderer can be used to create functionally safe systems. To learn more click on the button below.